Wind Up ! The smallest car in the world. My name is Perry Watkins and this is the story of my attempt to build the world’s smallest road legal car. So, how you set about building the world’s smallest car. Well fortunately I do already have some relevant experience. This is my last project, The Flatmobile (Show car) at just 19” high is the world’s lowest road legal car. 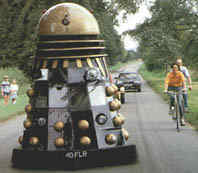 My first major custom project was this Road legal 9’ tall Dalek! Well the first thing I did was to carry out lots of research. There is no point in starting a project unless you have a good idea of what you are trying to achieve and that the end goal is actually achievable using the method you are proposing, so it’s essential that I do as much research as possible before I actually start the build. I researched the current record holder, to find out exactly how small that car is and also how the builder has designed such a small car. The world record for the smallest car is currently held by the Peel P50. The Peel engineering company built these cars in the Isle if Man during the 1960s. The Peel is 53” long, 39” wide and 53” tall. It is a quirky looking single seater with a 50cc engine and no reverse gear! I will need therefore to keep the dimensions of my car smaller than those of the Peel in order to be sure that my car is indisputably smaller. The second area that needs careful research and planning in the law. There are strict regulations that apply to the construction of motor vehicles and I must ensure that the car will comply with all the relevant specifications of the construction and use regulations. If the car does not meet all criteria, then I won’t be able to register the car and make it road legal. Well here you go folks. This is the body that I am going to use to build the worlds smallest road legal car. As I am sure you can see, it’s actually a Postman Pat Kiddies ride, as you find outside supermarkets and in shopping centres. Using the Postman Pat van body as the basis for the project achieves 2 things. Firstly it’s a ready made body complete with space for lights, radiator and windscreen etc. That really will save me lots and lots of work. Secondly, Postman Pat is a very well known character from children’s TV in England and using his van will add a huge amount of novelty value to the project. After all the whole point of doing this is to have a laugh! The first thing I did was to remove the body from the ride base, cut away the false wheels and then cut Pat and Jess the cat out of the vehicle. With that done I stood the body on blocks at the finished height and start to get some idea of what size wheels I am going to need to source and whereabouts to mount the engine etc. All of that will depend somewhat on how I squeeze myself into the car and what space is left over! I decided a quad bike would fit the bill and so purchased a brand new Shanghai Shenke 150cc automatic on eBay. The quad was completely dismantled and the rear seat section chopped off and replaced with a custom built 2”x1” box section seat frame to fit inside the body. The swinging arm was shortened by 6” along with the drive chain. And the brake calliper relocated underneath to make room for my posterior! The front wishbones were all remanufactured and new suspension mounting points fabricated. I then manufactured a new steering column assembly with a spiral bevel gearbox in the centre to transfer the drive through 90 degrees. For the wheels I plumped for Honda Monkey bike wheels and tyres on the rear and my friend Ian Mckenzie machined up the front wheels from scratch. That made a mess in his garage! The seat was upholstered by MK Auto upholstery and I made an aluminium key for the rear, this is driven by a small electric motor that turns at 15 rpm. Two gas rams from a Honda Jazz were then fitted to lift the body up. Time for a test drive…..
Bugger, that wasn’t supposed to happen! Final touches were lights from a street fighter bike, lucas indicators, 6mm laminated windscreen and a Pop Browns windscreen wiper system. Hilborn air scoop on the front, and 3” dummy exhausts on the back. And that's about it !! !